Paranormal Romance and More: Interview & #Giveaway with Jennifer Malone Wright, author of The Vampire Hunter’s Daughter Series! 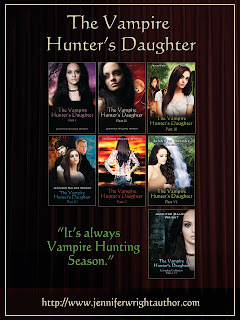 Interview & #Giveaway with Jennifer Malone Wright, author of The Vampire Hunter’s Daughter Series! Holly: Hi Jennifer! :) Would you tell us a little bit about yourself? Jennifer Malone: Hi! *waves* I am an author, but first and foremost I am the mother of five children ages 16, 10, 8, 4 and 2. I’ve been married to a great man for almost 12 years now and we live in the beautiful mountains of northern Idaho. I love living here most of the time, except the summer when it’s a snow bound hell. Jennifer Malone: Oh, I would totally have to save the people that were being held captive. I could never just leave them. I would free them and we would have to escape together. Hopefully we could find dingy boat that hadn’t been used yet and get away in that, if not I guess we would have to wait in the water until the ship blew and use pieces of wood to float on. Holly: Can you tell us a little bit about your book, The Vampire Hunter’s Daughter? It’s about a teenage girl who witnesses her mother being killed by vampires. She is almost taken but is suddenly saved by a bunch of vampire hunters. They take her to their community where she discovers the family she has never known and her heritage, that she is a vampire hunter as well, it’s in her bloodline which descends from angels and demi-gods. Jennifer Malone: For this particular book, The Vampire Hunter’s daughter, it was the characters. I was working on a back story for a character in another story I was writing and that is how I came up with Chloe. Normally though, it’s the plot that I think of first. Jennifer Malone: Right now, I’m working on a few things. 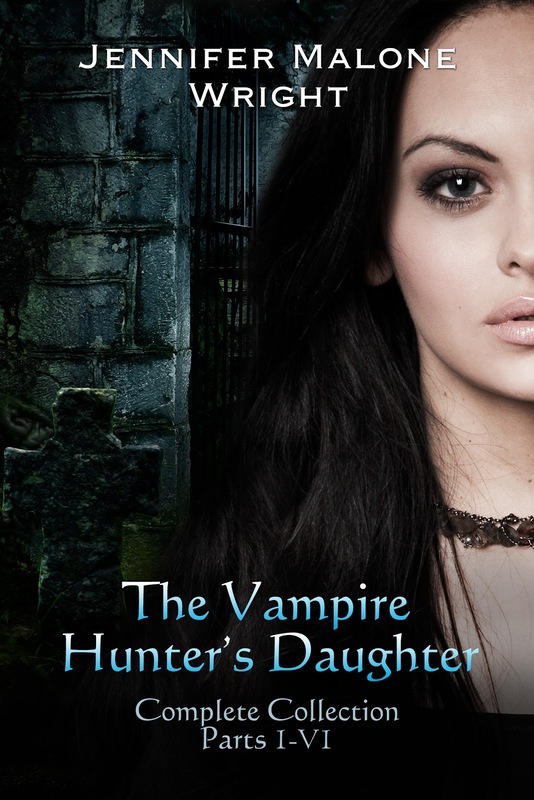 I’m working on the continuation of The Vampire Hunter’s Daughter in a series called The Arcadia Falls Chronicles. I am also working on the second novel in The Birth of Jaiden series, as well as a couple of shorter things. So, we should have something coming out fairly soon for you. Jennifer Malone: I’ve just started The Black Dagger Brotherhood. I know I should have already read this, but I’m excited to read it because I’ve heard good things about it. Jennifer Malone: Actually, I think about this all the time, there are several romance stories up my sleeve, but they would still be paranormal just now YA. I also have some childrens fairy tale type stuff that I wanted to work on. Jennifer Malone: I always like to tell my readers, first off, thank you!! And second, that you can always accomplish your dreams. So, don’t let anyone tell you that you can’t do what you want to do. With hard work and determination, it’s always possible. Jennifer Malone: Neither, this is the second I’ve written and published. My first novel is called The Birth of Jaiden, it’s a really great story about a child who is the fate of humanity. It has vampires, angels, fallen angels, witches and so much more!